Bradley's Cottage overlooks one of Creeslough's many lakes and the hills that Donegal is famous for. Just a mile from Creeslough village, the cottage sits on a large private site. With pubs, shops and dining locally, tourist amenities like Ards Forest Park and numerous beaches are within easy reach. The 4 star three bedroom family-run cottage (Sleeps 6) is an ideal country-side retreat. 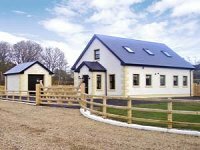 Modern and well-equipped, it provides an excellent base to relax and unwind, whist being within easy reach of all Donegal has to offer. A great base for exploring Donegal’s rugged North-West, Creeslough is the home of Medieval Doe Castle, Ards Forest Park, and the tranquil Ards Friary (with its waterfront walkway to the secluded Lucky Shell beach). North of Ards, explore the stunning blue flag beaches at Marble Hill and Killahoey. About 15 minutes away, the neighbouring village, Dunfanaghy, has an impressive Famine Museum (The Workhouse) with an exhibit telling the story of the potato famine from a local perspective. This along with Dunfanaghy's cafes and craft shops make it worth a visit during your break at Bradley's Cottage. The adjacent Horn Head Drive showcases Donegal's wild coastline at its best. Also in Dunfanaghy: golf and horse-riding. The cottage has 3 bedrooms: 2 double en-suite bedrooms, and a twin bedroom (1 single bed and 1 three-quarter [4ft] bed). A fully-tiled bathroom (bath and separate shower) serves the twin bedroom, while the double bedrooms each have a separate shower/toilet en-suite. A full-sized wooden cot can be provided, if required. A cosy living room with a leather-upholstered sofa and reclining armchairs awaits you off the hall, off which is a beautifully fitted modern kitchen designed to make light work of food preparation. A breakfast bar with high stools complements the kitchen. With an open fireplace (fuel not provided) in the living room for those slightly chilly evenings and full oil-fired central heating for unseasonable or winter season cold snaps, the Bradley's Cottage is snug and cosy year-round. The living room has a 32 inch flat screen (Direct LED) TV and DVD player. The kitchen is fully equipped with a four-ring electric cooker with grill, oven and extractor fan; dishwasher; washer-dryer; refrigerator; microwave oven; toaster; and electric kettle. All utensils, crockery, and cutlery are also provided. Other local attractions: The villages of Carrigart and Downings are 15 minutes east of Creeslough. 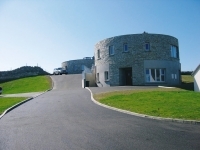 Carrigart is home to a diving school / indoor pool and horse-riding school. 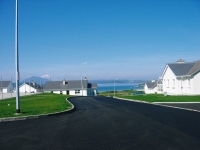 Downings highlights include several sandy beaches, a leisure centre / indoor play adventure centre for kids, and the renowned Rosapenna Golf Resort (preferential green fees available for guests at Bradley's Cottage). - We provide bed linen, bath and hand towels, tea towels (drying cloths), and a dish cloth. Where a cot has been requested, the client must provide the linen for it. Take the nearest national route to Letterkenny and from Letterkenny head north on the N56 for Creeslough. Bradley's Cottage is located on a country road just outside Creeslough. More detailed directions are provided on confirmation of booking.